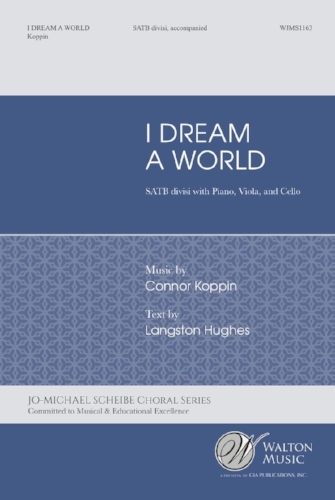 Consider programming, "I Dream a World", for your ensemble this coming year! It was recently selected as a part of Editor's Choice from JW Pepper. Cedar Rapids Xavier High School, Matt Walker, Conductor, spring premiere, Cedar Rapids, IA. This spring I will serve as Composer-In-Residence with the Detroit Concert Choir, Brandon Johnson, Conductor. The two new pieces will be taken on tour with the ensemble to Austria this coming summer. Texts: TBD. Michigan Men’s Glee Club and conductor Mark Stover will perform ‘O Ignis Spiritus’ as a part of their spring concert. The work is set to a text by Hildegard von Bingen and paints the ‘fiery’ spirit of the creator. It will be a brilliant performance! The work was originally written for Cedar Falls High School in memory of Benjamin Bartlett, elementary music teacher at Cedar Heights Elementary. The work is powerful, memorable, and heartfelt. Please consider programming it as it will surely be remembered by your students and community. I am really excited to be finishing my first work for Wind Ensemble. "At Night" will be available as a wind ensemble work coming in the Fall of 2018. Look for a score and recording this coming fall. The work will be co-commissioned by two PA high school bands. An audio recording of 'Your Hand in Mine' from this past spring is now available. Thank you to Dr. Copley and Shrine of the Ages Choir for bringing such magic to the piece. Additionally, I would like to thank Central Sound and Arizona Public Radio for capturing this performance at Camelback Bible Church in Paradise Valley. Give the piece a listen! Four new recordings are now available through Soundcloud! Consider perusing one of these works for your ensemble for this fall! Your singers will so enjoy the experience. Northern Arizona University and Dr. Edith Copley will premiere "Your Hand in Mine" this coming February. The performance will take place as a part of the Annual Jazz/Madrigal Festival Host Concert at the Ardrey Memorial Auditorium on the NAU campus. Dr. Copley has informed be there will be over 1,500 high school students in attendance. Another work will premiere with Dr. Joseph Ohrt and the Central Bucks High School-West Choir. Dr. Andrew Last will lead the TMEA All-State Men's Choir in a performance of 'She Walks in Beauty'. The work was originally written for Andrew and the Luther College Norsemen in 2015. The University of Cincinnati Men's Choir will premiere "Ignis Spiritus" as a part of their program at the Intercollegiate Men's Choir National Seminar. The University of Cincinnati Men's Choir, director Kevin Coker, will premiere "Ignis Spiritus" in preparation for their performance and the Intercollegiate Men's Chorus National Seminar. The Baylor Men's Choir under the direction of Randall Bradley will perform "Jesu Dulcis Memoria" as a part of their Southwest ACDA performance in Oklahoma City. The Master Singers of Eau-Claire, WI will premiere "Your Little Ones" as a part of their Lessons and Carols. The work is written for SATB choir, strings, and oboe. "Let us Walk Softly on the Earth" will premiere. Written for Dr. Joseph Ohrt and the Central Bucks High School-West Choir. "Waves that Seek the Shore" will premiere with the Master Singers of Eau Claire, WI. I will be writing a 3-5 minute work for unaccompanied choir for the Fox Chapel Area High School Madrigal Singers. The ensemble is located in Pittsburgh, PA and is conducted by Benjamin Murray. The work will be performed at the PA ACDA Conference in 2017. The Master Singers of Eau Claire Wisconsin will premiere, "Circles of Motion" with text by Joy Harjo. The piece will premiere on March 18th at the Basilica of St. Mary's in Minneapolis, MN. The Master Singers of Eau Claire Wisconsin have commercially recorded my work, "A Star's Light". This is an arrangement of John Jacob Niles' "I Wonder as I Wander" for SATB A Cappella Choir. Visit the Master Singers' website for information regarding purchases. Both of my pieces, "There Will Come Soft Rains" and "When Music Sounds" will be available for purchase from Santa Barbara Music Publishing this coming January. Consider giving both of these well received works a look for your ensemble today! Premiere of "The Little Road"
PCDA Premiere of "At Night", Benjamin Murray, Fox Chapel High School. Premiere of "At Night" by the Fox Chapel Area High School Madrigal Singers, Benjamin Murray, Conductor. The piece will premiere at Pennsylvania Choral Director's State Conference. Derrick Brookins and the Plano Senior High School Men's Choir will perform "She Walks in Beauty" as a part of their National ACDA performance this coming February. "The Unknown Region" available through the Choral Arts Initiative Choral Series in collaboration with Music Spoke. The series is edited by CAI's conductor, Brandon Elliott. I am thrilled to be a part of this series seeing as I am admirer of this ensembles and their wonderful choral achievement. After a great time in New York last weekend and an amazing performance by Michael Kerschner and the Young New Yorkers' Chorus, I am proud to take the title of "Winner of the Nathan Davis Prize" in composition. The Young New Yorkers' Chorus has an amazing competition for young composers and it has long been a goal of mine to be a part of it. The ensemble does a brilliant job of supporting new music and fostering creativity in young artists. I hope that all composer friends will choose to be a part of it! View http://ynyc.org/composers-competition to see/hear more. Young New Yorkers' Chorus Premieres "-a little space-"
The Young New Yorkers' Chorus will premiere "-a little space-" for SATB Choir with piano in New York City as a part of their Young Composer's Competition. The piece sets a text by Walt Whitman that begins with, "out of the rolling ocean". The work is an attempt at contributing to the concert's theme of "connections". Dr. Andrew Last will lead the Minnesota Men's All-State Chorus in a performance of "She Walks in Beauty" published by Walton Music. This is one of my favorite organizations/ensembles to work with. I have had the pleasure of watching this week of music making change the lives of young singers under the direction of Lee Nelson and can't wait to see the same result under the engaging Andrew Last! I am so thrilled to be serving as Composer-in-Residence for The Master Singers of Eau Claire, WI this coming year. The group is masterfully lead by Dr. Gary Schwartzhoff of University of Wisconsin Eau-Claire. I will be writing two works for the ensemble in this season, the first of which will be an arrangement of "I Wonder as I Wander" entitled, "A Star's Light". The work will serve as the center piece for the Singers' December concert. The second work is TBD. Visit http://www.themastersingers.net/index.html for more information! St. Edmond's Catholic High School premieres "On Music"
Tori LaCroix and the St. Edmond's Catholic High School Concert Choir will be premiering a new setting of Thomas Moore's "On Music" in honor of a late community member, and advocate for the arts. The piece is written for SATB Choir with Piano. NAU Men's Chorale performs "She Walks in Beauty"
The NAU Men's Chorale under the direction of Joelle Johnson will perform, "She Walks in Beauty" at the NAU Spring Festival of Choirs at Ardrey Memorial Auditorium in Flagstaff, AZ. Ithica College to perform "She Walks in Beauty" and "The Waters Wrecked the Sky". Dr. Derrick Fox and the Ithica College Concert Choir perform, "She Walks in Beauty" and "The Waters Wrecked the Sky".